← BUSINESS…One Word, Express In One Hundred Words In One Hundred Days. BUILDING…One Word, Express In One Hundred Words In One Hundred Days. Build Your Life If You Want To Live It. 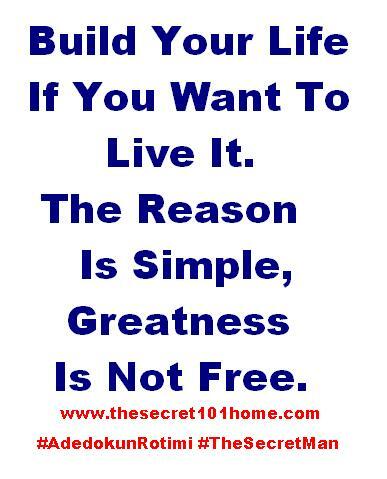 It Is Simple, Greatness Is Not Free. Greatness Is A Product Of Your Determination, Dedication, Discipline And Devotion. Every Great Building Has It Greatness In Good Foundation. Therefore, To See Good Building You Have To Invest In The Foundation. Foundation Is Preparation. If The Time Use In Founding A Good Building Is Not Wasted, So Time Use In Preparation Cannot. No House Is Built Overnight, So There Are No Overnight Success. If You Found One, That Means Someone Stay Overnight To Make It Happen. Build Your Life And Make It Count. This entry was posted in Self Development, The Secret, Vitamin Of The Mind and tagged Bishop David Oyedepo On Building, Foundation Is Preparation, Good Foundation, Greatness, How To Build A Good Life, How to live A Fulfilling Life, How To Make My Life Count, JIm Rohn On Building, Pastor E A Adeboye On Building, Rotimi Adedokun On Building, The Tallest Building In The World. Bookmark the permalink.